Soccer in Brazil, rugby in New Zealand, college football in Alabama come to mind as comparisions. In Sport there are moments when world’s almost comic randomness, indifference and injustice subside. Everything is golden, the eternal verities and gods come together -- and hold. Michael Jordan hitting the jumper at the buzzer to win it all once again. Kirk Gibson, one-legged, swatting the winning homer with two out in the bottom of the ninth. Jack Nicklaus finding the magic one last time on Augusta’s back nine. 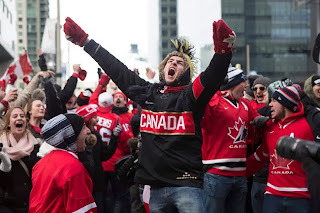 The past few days Canadian hockey fans have had several such moments – thanks to our mens and women’s hockey teams. Facing the world’s best, they ran the table. The men with unstoppable power and grace against the splendid Swedes. The gals with an improbably come-from-behind win against a formidable US squad. The womens team captured the hearts of a nation, and have inspired a new locker room refrain. Sochi provided many such moments in a variety of sports, but these ones were special to us puck-heads.